This breathtaking alpine hike is a pleasant alternative to the busy Enchantments. Although perhaps not quite as beautiful as the Core Enchantments, the alpine lakes along Icicle Ridge are among the most spectacular in the state. But this hike is not for the feint of heart. With 4500 feet of elevation gain to Lake Edna (almost all at a 1000 feet per 1 mile ration), this hike is grueling to say the least. The hike starts off gradual enough, but don’t let that fool you. Within the first half mile, your climb begins in earnest: about 2000 feet in about 2 miles. Near the end of this part of the climb, you’ll come across a few campsites along the trail and several stream crossings. Just when you think your legs can’t take any more, a welcome change comes in the form of a gradual me through a hanging valley. Here you will get your first big views of the towering granite peaks you’ll be playing in. If you’ve had enough for one day, stop at one of the campsites just before the hanging valley. They have good water sources and nice protection. But if Epic views are what you seek, onward you must climb: up, up, and out of this sub-alpine valley. After a mile of gradual trail, the climb begins again in earnest, gaining around 1600 feet in a mere mile and a half. This climb is grueling and completely exposed to the sun (not ideal on a hot day). But, the views are worth it. Around every corner, there is more to see of this awe-inspired landscape. As you climb, you’ll see the remnants of an old avalanche that took out a field of trees at the base of the towering granite peaks. A reminder that we are but ants in the shadow of these ancient mountains. You will come near the creek on the way up, which is good on a hot day, you may want some fresh water in the middle of your climb. If you are gentle with your approach, you are likely to see ptarmigans, pica, and marmots on your hike up. I also saw goat duff hanging from branches as I climbed. Wildlife is teaming in this area, probably in large part due to a lack of visitors. The climb alone is enough to deter many potential travelers from this alpine heaven. You’ll also see countless birds chirping and hopping around in the rocks and small trees here. All in all, this valley is vibrant with wildlife. And this was where I found the first ripe huckleberries and blueberries of the season. Note the difference in these two mountain delights. Blueberries have a milky blue look to them, while the huckleberries have a darker reddish-blue color. 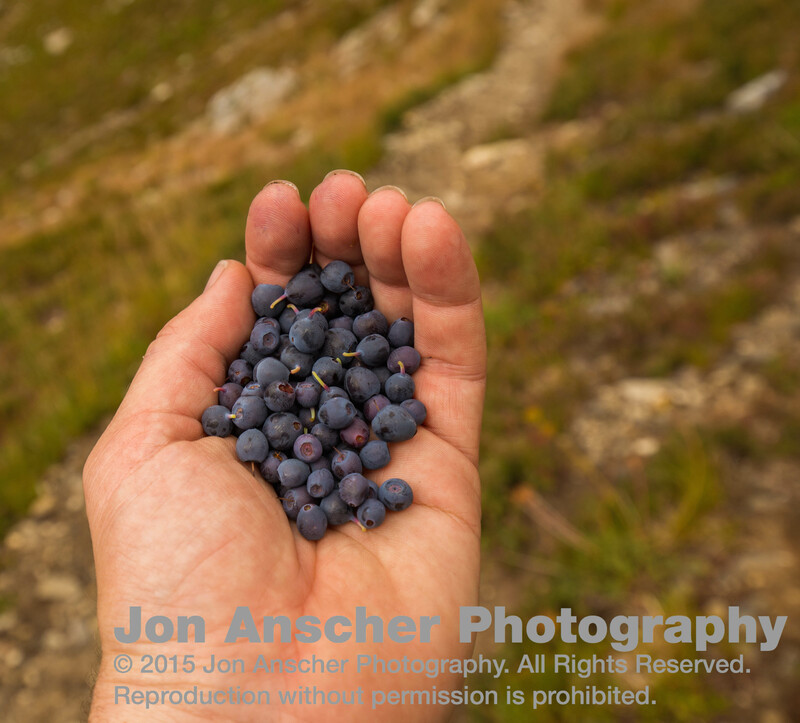 My climb slowed here, as I found myself stuffing handfuls of these delicious berries down my face. I was also grateful to have a cloudy day with which to climb this highly exposed trail. As you near the top, you find yourself coming into a second hanging valley for the final 500 foot push to the top. Once you reach the saddle, take a moment to catch your breath and look around. Sadly, low lying clouds blocked much of my view beyond the nearby peaks and valleys, but on a sunny day, there is no doubt you’d see some volcanoes in the distance. From here, you have a steep 300 foot descent followed by a bit of more or less flat terrain. At the very bottom of your descent there is a nice campsite, though water is sparse here, and may require a walk depending on the time of year you visit. If you keep going, you will cross a couple small streams and there are places along the way to stop and camp. This can be ideal if there are high winds as these lower camps will be more protected. However, the way ahead offers even better camps if you have the energy to keep going. After some ups and downs, you’ll climb through several bowls and then come across a trail junction. To the right the trail losses elevation fast and then climbs back up to Lake Augusta. To the left, Lake Edna is a mere half mile away and a few hundred feet up. The climb steepens again here until you finally reach this alpine lake. There are spots here to find camp, so long as you stay 200 feet away from the lake. This small lake is easily contaminated, so protect it by camping with care. By the time I made it up to the lake, I found myself in a white out. The low lying clouds were being pushed down the mountainside by the heavy winds, so I found myself being pelted by water as I made the final climb to the lake. The chill already beginning to seep in, and the unseen sun low on the horizon, I began to quickly search for a good site. After some work, I found a small nook in which to stick my tent. I set up, and got all my gear inside. Making a quick run to get water, I tucked into my tent where I stayed for the night: cooking the the vestibule and trying to stay warm. The following morning found rays of the sun seeping through the cloud cover to bring me out of my slumber. I woke long enough to get out of my tent and snap a few sunrise pics, before deciding it was took cold and sneaking back into my tent. I wished I had my warmer sleeping bag and a couple more layers, but I stayed in my tent for a few more hours before the sun had a chance to warm the land. Eventually, I got up for good and began to explore the area. A friendly ranger came and chatted with me for a while. I had seen their tents in the white out last night, and as it turned out, I had shared my camp with two forest service rangers doing some work in the area. After talking with him and getting some breakfast, I struck out to explore the area some more. Almost immediately I startled a family of three goats who were grazing in the area. Despite only having my 16-35mm wide angle lens on a full frame camera and there being very little sun getting through the thick clouds overhead, I followed these goats around for a couple hours, getting several decent shots. They were a bit skittish, but got used to my presence and allowed me to follow them as they roamed the area. After following the goats for a while, and exploring the area, it was time for me to head home. I knew I had a never ending down ahead of me. So, I packed up camp, everything just a little damp, and struck out. The down was tedious, but revisiting the places I saw through mist and overcast skies was worth the effort. I eagerly await return to this place with more time and clearer skies. 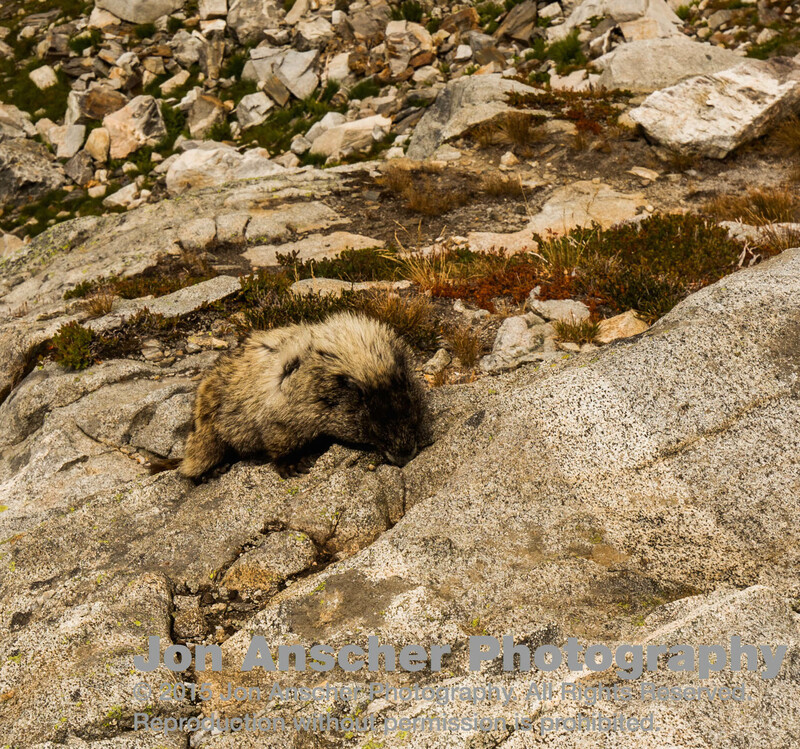 To see more photos or buy some prints or digital copies from this trip, checkout the gallery at Jon Anscher Photography.